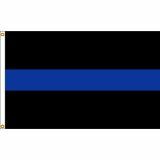 Tuff Flags has a complete line of Fire and Police Department Flags for sale. These fire and police department flags also include memorial flags and honor flags for both the serving and fallen police officers and fire fighters. 100% Made in the USA, these flags have the highest quality standards. 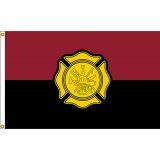 Show your appreciation to our police force and firefighters with these firemen and police flags made available from outdoor and indoor flag styles to garden flag styles. Shop right away and take advantage of our best prices, quick shipping and much more! 100% customer satisfaction guaranteed! Tuffflags.com supports and honors fire fighters and police officers that put their selves at risk in the service of their neighbors. Show your respect and honor the sacrifice of these men and women and what they stand for with these fire and police department flags. No matter whether you are one of the proud families of these forces or the general public simply looking to show your support to these personnel, we have a fabulous range of flag options to choose from. 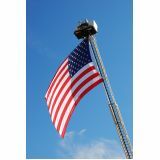 Available in indoor and outdoor flag choices in durable nylon and a number of design choices, these flags are great to show your respect to the police and fire fighters who risk their lives to keep you and your family safe. Browse our collection and choose from a range of Fire & Police Department Flags in various sizes and models. Should you need any tips or shopping assistance, call us at our toll free number (888) 287-3524 or email us at customercare@tuffflags.com.and we can easily walk you through the ordering process.